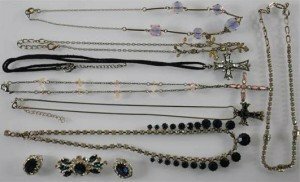 A costume jewellery brooch, set with blue and white stones, together with a small quantity of sundry necklaces and ear studs. 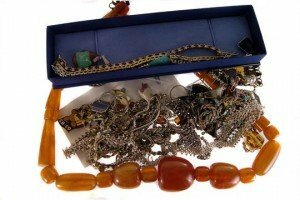 A collection of silver and costume jewellery, the sterling marked items to include a Millennium stamped abstract pendant on a belcher link chain, an onyx and red coral pendant in a two colour mount, a turquoise set Greek key bracelet, a puzzle ring, and other items, such as a Marcel Druker boxed watch and freshwater pearl necklace set, an amber bracelet, and a group of costume jewellery. 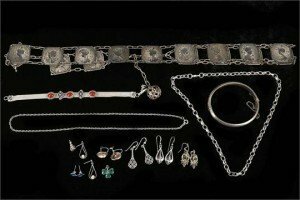 A miscellaneous collection of silver jewellery, comprising a pair of cameo earrings, .925 silver jailer’s link chain, hallmarked silver hinged bangle etc, together with a white metal panel belt. 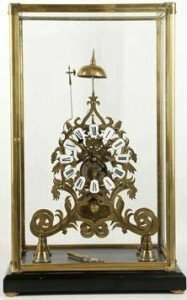 A brass skeleton clock with fusee and striking movement, enamelled cartouches with Roman numerals, in a bronze and glass display cabinet and on plinth. 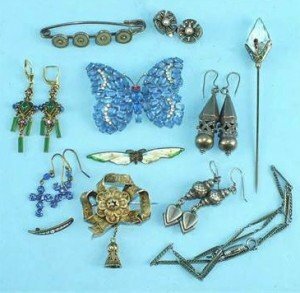 An enamelled brooch in the form of a butterfly, a large paste-set butterfly brooch, two pairs of paste earrings, other earrings and other jewellery. 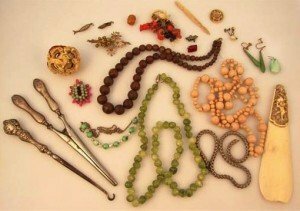 Various oriental jewellery and effects, to include a miniature ivory puzzle ball, 3cm dia. ivory shoe horn, a quantity of polished beads, other jewellery, floral plaque, etc. 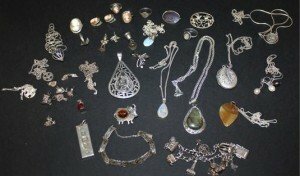 A large collection of mainly silver jewellery to include rings, bracelets, brooches and hallmarked silver items to include teaspoons and a handbrush. 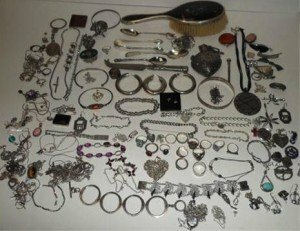 A collection of mostly silver jewellery, including five rings, five brooches, a rectangular ingot shaped pendant, a charm bracelet and loose charms. 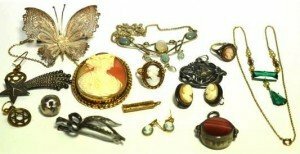 A small quantity of gold and silver jewellery to include a 9ct gold cameo ring, a similar silver marcasite example, silver brooches to include a filigree butterfly example, a yellow metal framed cameo brooch etc. 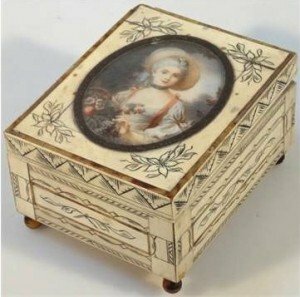 An early 20th century ivory finish jewellery casket, the hinged lid set with an oval profile of a lady, signed Favart, revealing a plain interior possibly cedar lined, the whole raised on orb supports, 8cm high, 10cm wide, 12cm deep. 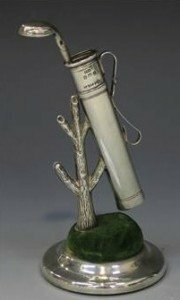 An Edwardian silver novelty golfing jewellery and hat pin stand, in the form of a golf bag and club supported by a ring tree, on a circular pin cushion base. 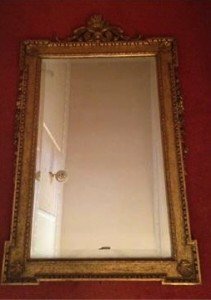 A pair of 19th century gilt wood and gesso wall mirrors, in the manner of William Kent, with shell and foliate scrolling pediments, shell spandrels, egg and dart moulding with floral appliqués and rectangular bevelled plates. 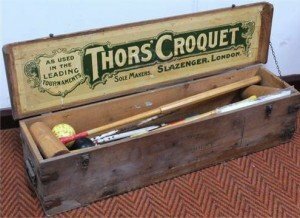 An early 20th century Thors’ Slazenger croquet set, comprising mallets, coloured balls, target stick and hoops, in a pine box, with interior label. 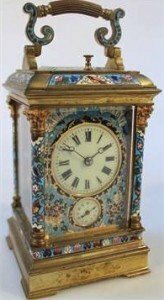 A late 19th century French gilt brass and champleve enamel striking and repeating carriage clock, the anglaise case surmounted by a scroll handle, the 4.5cm dia dial with Roman numerals with moon end pointers above an Arabic subsidiary second hand, contained in a four glazed case set with composite capitals, heavily enamelled with birds and flowers revealing a twin barrel movement, double strike on gong and slow and fast features. A 9ct gold gate bracelet, with heart shaped clasp set with three Victorian sovereigns, for 1873, 1890 and 1900 each claw set, 18cm wide, 31g all in. 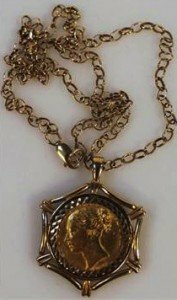 A Victorian gold full sovereign, dated 1860, contained in a 9ct gold star pendant attached to a slender link chain, 52cm long, 20g all in. 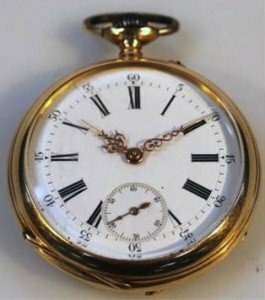 An early 20th century open face pocket watch, the circular 4cm dia enamel dial with Roman numeric and Arabic numerals, pierced pointers and subsidiary second hand in a plain case, yellow metal marked 0.585, with Ancre back plate. 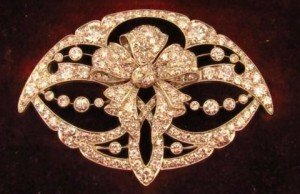 An exquisite Edwardian diamond set brooch, of pierced oval shape, set overall with matched diamonds, with a central floral and ribbon motif, the two larger stones of 4.8mm diameter, spread through to 0.01ct, all in a hand carved white precious metal setting. 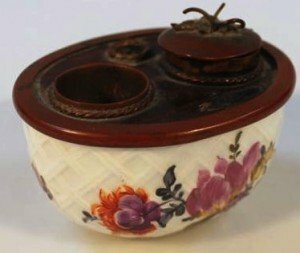 A 19th century Continental porcelain inkwell, of oval outline with articulated metal mounts with space for ink and quill, the oval body hand painted with flowers on a oval foot, with a latticework decoration, unmarked, 9cm wide. 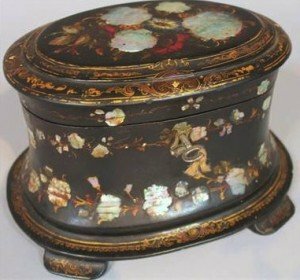 A Victorian papier mache and mother of pearl tea caddy, of oval outline the hinged lid decorated with flowers inset with various mother of pearl pieces with a green baize line back, hinging to reveal a fitted interior with two D-end sections, each foil lined with mother of pearl knops, on an oval body decorated with a further geometric floral banding, the whole raised on compressed feet.